Looking for a different Battle of Alnwick? Try the Second Battle of Alnwick (1174). In the late eleventh century Malcolm III sought to claim northern England for the Scottish Crown. With William II distracted by political events in Normandy, the Scottish King invaded but was ambushed and killed at the first Battle of Alnwick (1093) by an English force under Robert de Mowbray, Earl of Northumbria. In the ninth century AD, the Kingdom of Scotland came into being when the Picts and Scots north of the Clyde-Forth isthmus united into one nation. The following century saw England emerge as a united political entity as the children and grandchildren of King Alfred the Great expelled the Danes. Between these two emergent nations was the Kingdom of Northumbria which stretched from the River Humber to the River Forth. Control and influence over this important buffer zone alternated between the two emergent Kingdoms. In AD 927 it was reduced to an Earldom and incorporated into England under King Athelstan. However, in 1018 Malcolm II of Scotland won a decisive victory at the Battle of Carham and took control of all land to the north of the River Tweed effectively splitting the territory. The Earldom remained divided after the Norman invasion of England with William I appointing strong magnates to control the English held portion. However, the Scottish Kings continued to regard the lands of northern England as theirs and looked for opportunities to recover them. William I died in 1087 and his vast domains - England and Normandy - were divided amongst his two eldest sons. Robert Curthose succeeded him as Duke of Normandy whilst William Rufus became King William II of England. Between 1087 and 1091 the two brothers vied for supremacy and Malcolm III of Scotland used this distraction to assert his claim over Northumbria. He invaded in 1091 but this was quickly defused by the arrival of a large English army headed by William II himself. The following year the English King invaded Cumbria displacing a noble, Dolfin, who was a retainer of Malcolm III. The construction of Carlisle Castle and the importing of English settlers, made it clear that William II was seeking to entrench English power in the north. This led to the Scottish King deciding to invade England again. Malcolm III advanced into Northumberland in Autumn 1093 advancing across the Cheviot Hills. By November 1093 he had arrived outside the walls of Alnwick Castle and camped his forces on the high ground overlooking the Aln Valley. In response Robert de Mowbray, Earl of Northumbria mustered a small force at Bamburgh Castle and marched to relieve Alnwick. As he had inferior numbers, Robert made a covert approach hoping to surprise the Scots. The English force was under the command of Robert de Mowbray, Earl of Northumbria- an experienced military commander. 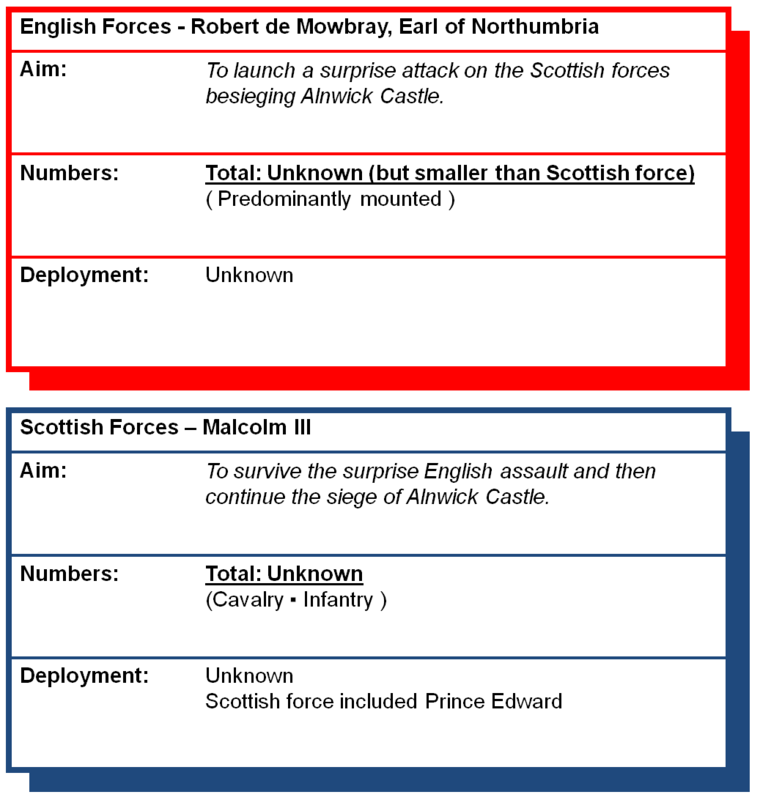 The Scottish force was under the direct control of Malcolm III (known as Malcolm Canmore), who was around sixty years old at the time of the battle but again an experienced campaigner. The numbers involved on each side is unknown but the English force was certainly significantly smaller than the Scottish army. The battle was fought on 13 November 1093 but, despite its title, it was little more than a skirmish. Robert de Mowbray successfully made a covert approach upon the Scots catching them completely by surprise. Chaos reigned as Robert pressed home his attack in which Malcolm was skewered and killed by an English lance. His eldest son, Edward, was also mortally wounded in the assault and later died of his wounds. The leaderless Scots soon broke into rout and retreated. 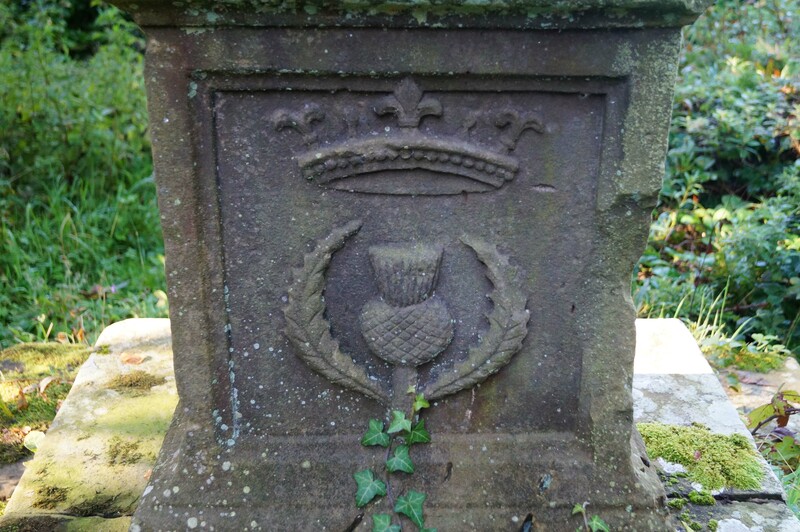 The King's body, and that of his son, were interred at Tynemouth Priory and allegedly later moved to Dunfermline. Malcolm's death led to political chaos in Scotland. The late King's brother, Donald Ban, took control but William II supported the claim of Malcolm's son, Duncan. He provided an army and Duncan marched north to oust Donald. However, he was deposed after less than a year in power and Donald restored. In 1097 William tried to influence the situation again by supporting another of Malcolm's sons, Edgar. He successfully seized power and thereafter reigned as a client King of William II and Henry I until his death in 1107. The battlefield has changed significantly since the eleventh century as, although still largely undeveloped, it has been landscaped and actively managed for agricultural purposes. A monument has been erected to mark the site where Malcolm III allegedly died. Alnwick Castle, which Malcolm was besieging prior to the battle, is a major tourist attraction although subsequent upgrades and prettification mean it bears no resemblance to the fortress that stood on the site in 1093. Battlefield. The view of the battlefield from Alnwick Castle. Monument. 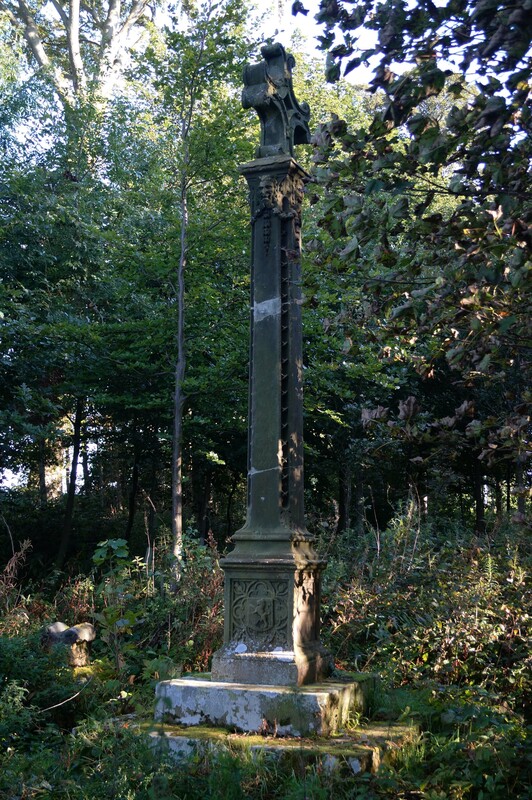 The Gothic style cross was erected in 1774 by Elizabeth Percy, Duchess of Northumberland, a descendant of Malcolm III. It is said to mark the spot where the King was killed. Alnwick Castle. The castle had been built following the Norman invasion by Gilbert de Tesson (also known as Tyson), a Norman Knight who had been William's standard bearer at the Battle of Hastings. The original structure was a small earth and timber fortification built at the point where the Great North Road, a major route north/south route, crossed the River Aln. Bamburgh Castle. 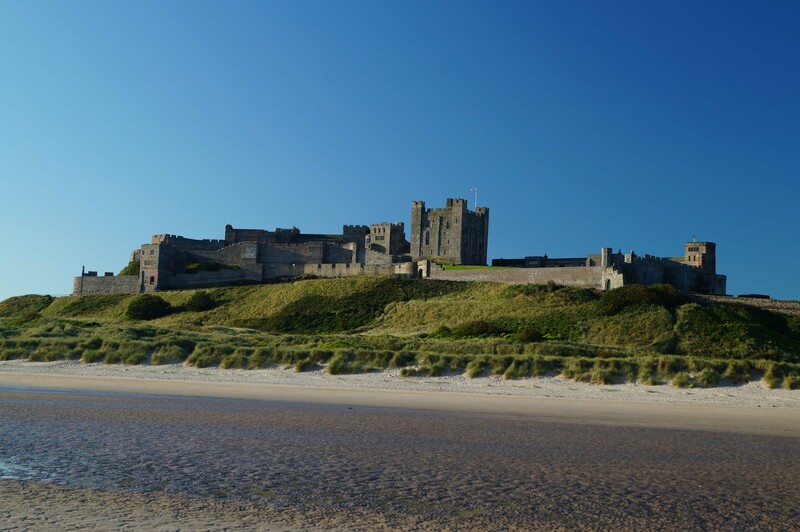 Like Alnwick Castle, Bamburgh has been substantially rebuilt in the centuries since the battle with the bulk of what is visible today dating from the nineteenth century. However, it was from this site that Robert de Mowbray deployed with his small force in order to relieve the siege of Alnwick. The castle is found 13 miles to the north of Alnwick. 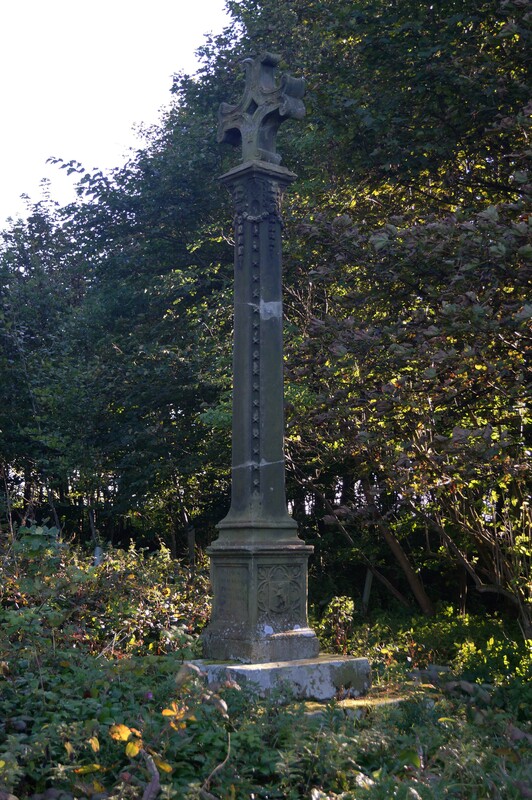 The monument marking the site of the Battle of Alnwick (1093) can be found off the B6341 to the north of Alnwick. It is in a copse of trees and not immediately obvious from the road. There is a lay-by on the B6341 and the gate accessing the site is around 50 metres to the north before the roundabout. Visitors may also wish to combine their visit with a trip to Alnwick Castle, details below. 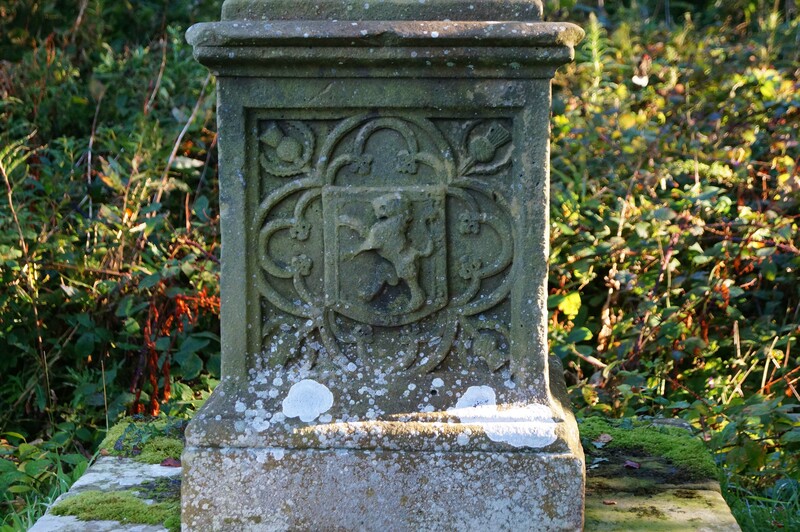 There is also a plaque marking the capture of William the Lion at the Second Battle of Alnwick (1174). The latter is found just before the entrance to Hulne Park. Be careful you don’t miss it - it is behind some railings on the left side of the road as you approach the Gatehouse that marks the entrance to the park.